The Andhra Pradesh State Council of Higher Education has released AP ICET Seat Allotment Result 2017. Candidates seeking admissions into MBA or MCA Programmes can check these latest updates. Authorities conducted AP Integrated Common Entrance Test on 2nd May 2017. Aspirants can download APICET MBA Seat Allotment letter from official website at apicet.nic.in. Around, 62962 candidates appeared for the AP ICET-2017 Exam and 54503 qualified in the Entrance Test with 86.56 of total marks. Those who qualified in the exam had completed Certificate Verification from 11th to 15th July 2017. The option filling is from July 14 to July 17, 2017. So, aspirants can check Andhra Pradesh ICET Seat Allotment Results 2017 from online. The Qualified candidates of AP ICET-2017 can check category wise Andhra Pradesh ICET Seat Allotment Results 2017. Sri Venkateswara University, Tirupati has organised Andhra Pradesh Integrated Common Entrance Exam (AP ICET-2017) as per the schedule. 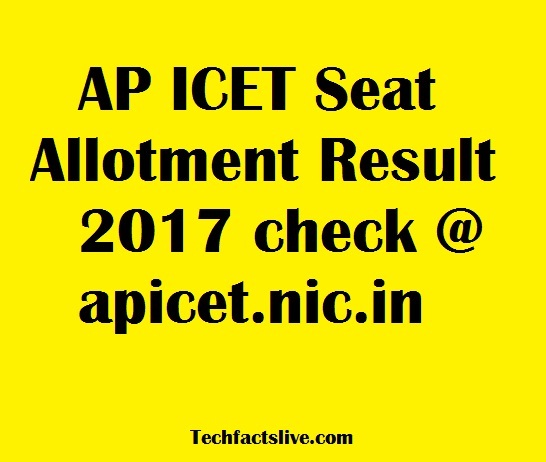 Candidates have to check AP ICET Seat Allotment Result 2017 from apicet.nic.in. Soon after the completion of Document Verification, the Seat Allotment Process has started. Authorities allotted 70% seats of Convener Quota and 30% seats of Management Quota. Aspirants can check AP ICET Seat Allotment through log in process with Registration Number & DOB. Candidates will get admissions into Master of Business Administration (MBA) & Master of Computer Application (MCA).